Now this in intriguing! According to recently filed documents Universal Parks & Resorts is looking into how to seamlessly combine the virtual reality world with real-life rides to further raise the bar at it’s theme parks. A new patent, dubbed systems and methods for generating augmented and virtual reality images, is seeking to add the use of augmented reality or virtual reality goggles to ride systems to help project virtual images that guests will potentially see on rides. Augmented reality is when a device like goggles superimposes computer-generated images via the lenses that make it appear as if the image is in the viewer’s real-world environment. Present embodiments relate to systems and methods of providing an augmented reality (AR) experience, a virtual reality (VR) experience, a mixed reality (e.g., a combination of AR and VR) experience, or a combination thereof, as part of an attraction, such as a thrill ride, in an amusement park or theme park. In certain embodiments, each ride passenger may be provided a pair of electronic goggles or eyeglasses to be worn during a cycle of the thrill ride. The electronic goggles may facilitate an AR experience, a VR experience, or a combination of both experiences. Thus, the electronic goggles may be referred to as AR/VR goggles. 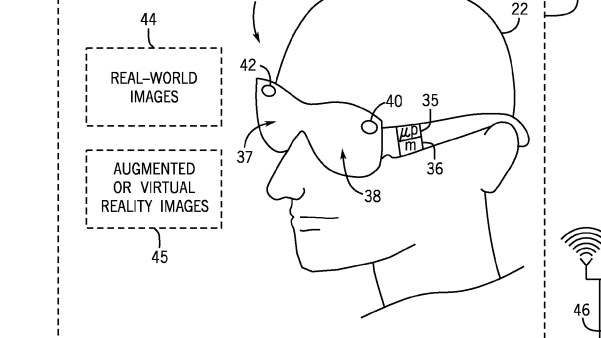 The patent goes on to discuss how the goggles could be used on a ride or even in a exterior theme park setting where guests could wear goggles and see additional superimposed images in an existing real-world themed area. The patent doesn’t state which Universal attraction could use this technology, but many some them park observers have surmised that the new Super Nintendo World expansion planned for Universal Studios Japan in 2020, as well as the Orlando and Hollywood parks later on, would use the technology. The way the technology might possibly work for a Mario Kart ride is for guests to be given augmented goggles and they would be able to see other Nintendo characters in the race, as well as other environmental factors from the Mario Kart video game series. That also supports an earlier Universal patent where guests will have control of their cars and potentially be able to aim items/weapons at other real or virtual cars in the environment. Universal’s patent states the reason it is seeking this approach is due to the fact that adding new factors or elements to themed areas or rides can be challenging. “Outside of providing an increasingly complex system of steep, twisting, and winding rollercoaster tracks, the thrill factor of such rollercoasters and/or other similar thrill rides may be limited to the existing course or physical nature of the thrill ride itself. It is now recognized that it is desirable to include components of interest and thrill factors in such attractions in a flexible and efficient manner relative to traditional techniques,” said the patent, alluding to the fact that the use of augmented or virtual reality could solve that issue.